So, at its annual conference on the weekend, New Zealand First voted to introduce legislation forcing new migrants and refugees to sign a pledge that they’ll abide by a list of “ New Zealand values” – presumably, as a condition of entry to this country. Respect for gender equality, legal sexual preferences, freedom of religion and a commitment not to campaign against alcohol consumption are among the values the Bill includes. 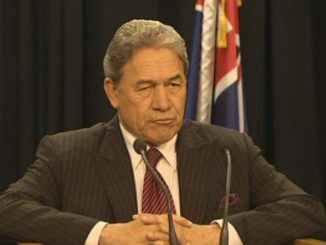 [NZF leader Winston]Peters told Morning Report people signing up to NZ values would help to deter the mass exploitation of migrants including of Indian students and of new nationals in the restaurant trade. Nice try, Winston. Try to make it seem as if we’re only stopping them from hurting each other. But does Peters seriously think that an unscrupulous restaurant owner who is (a) in all likelihood already a New Zealand citizen and (b) already defying existing NZ law by paying vulnerable workers below the minimum wage, would suddenly become a law-abiding, compassionate employer because they’d signed a pledge to be nice? Plainly, the pledge is not about them: it’s all about us. It’s a sledgehammer to make them act like the version of us that we claim to be. Sure, it would be helpful for migrants and refugees to be made aware of New Zealand laws on a range of subjects. Yet signing a compulsory pledge to respect an arbitrary list of “values” is nothing other than neo-colonial bullying. It begs a lot of questions over what such a list should contain, the degree to which these sentiments are observed by current New Zealand citizens, and what consequences would ensue if the pledges are not observed. Would people be dobbed in if they didn’t live up to scratch? Laws are different : they have to be obeyed, by everyone. “Values” are far more diffuse. Take for instance a pledge to observe ‘gender equality.’ Fine and desirable in principle. Yet by law it is compulsory in only some respects. If in future a migrant pays women less then men for the same task would that render them liable for… what exactly? A prosecution? If so, why shouldn’t a lot of other New Zealanders who don’t observe pay equity be joining them in the dock? The proposed list also looks bizarrely selective. Why should any migrant or refugee sign away their right to campaign against liquor consumption? In some parts of south Auckland, having more liquor outlets or pokies is seen to be socially undesirable. Why then, should a Muslim migrant or refugee be excluded from a campaign aimed at limiting the number of such outlets? In similar vein… some non-European migrants and refugees are vegetarians. Does NZF think vegetarianism should also be regarded as undermining New Zealand’s meat eating lamb-exporting values? That’s the problem. What NZF is trying to do is use the law as a blunt tool to force assimilation upon people, and render them subservient to an idealised form of the white monoculture. It won’t succeed. This isn’t the 1950s anymore, when foreigners were so rare as to be widely seen as alien and threatening. Long ago though, New Zealand embraced diversity. The law is the law, for everyone. In the end, using an additional pledge ceremony to control the behaviour of people felt to comprise a lesser class of citizens is not the sort of value that many New Zealanders would want to endorse. Too bad for PM Jacinda Ardern that her big speech at the UN happened on the day when the United States was transfixed by the Senate testimonies of Supreme Court nominee Brett Kavanaugh and Christine Blasey Ford, one of the women who has accused him of sexual assault. In the end, the Senate Judiciary Committee voted along party lines to confirm Kavanaugh, on condition that an FBI investigation be held before Kavanaugh’s nomination goes before the Senate, for a final confirmation vote. Initially, the Republicans on the Senate committee had indicated that the FBI itself would decide what it would investigate, and for how long. President Donald Trump also said as much. Yet as Slate has reported, the White House has since issued the FBI with a set of limiting conditions. The White House’s constraints on the investigation will have real consequences when it comes to the legitimacy of whatever information it digs up. For example, while the FBI will question Mark Judge, who Christine Blasey Ford alleges was in the room when Kavanaugh assaulted her, they won’t be allowed to seek corroborating evidence like Judge’s employment records. (Ford recalled running into Judge at his job at Safeway after the assault; determining when he was working there might help put a date on the party she describes.) It’s also unclear what recourse would be open to investigators if one of the witnesses they are allowed to interview gives them a promising lead to follow up on. Some critics have lamented that the elevation of a conservative partisan like Kavanaugh to the Supreme Court would diminish its role as a check and balance within the US political system. This seems desperately naïve. In reality, the Supreme Court has been acting in an openly partisan fashion for nearly 20 years, ever since it threw the 2000 election to George W. Bush. Since then, the Supreme Court has used its Citizens United ruling in 2010 to remove the restraints on election financing by major US corporates. In 2013, the court overturned (via its Shelby decision) some of the key civil rights protections contained in the Voting Rights Act 1965, thereby making it easier for Republicans to disenfranchise poor, black and Latino voters considered likely to vote Democrat. Kavanaugh may be a partisan choice, but today’s Supreme Court has little credibility left to lose. Oddly, some of Kavanaugh’s defenders have invoked the “innocent until proven guilty” standard for the accusations against him – as if Senate hearings amount to a criminal trial, which they plainly do not. The Senate Judiciary Committee didn’t conduct a wide-ranging criminal investigation. It called on only Ford and Kavanaugh to testify, and despite the she said/he said situation that ensued, the Republican majority on the committee refused to call the only witness (Mark Judge) to the events in question. As to whether Kavanaugh was the hard drinking party animal “Bart O’Kavanaugh” described in Judge’s memoir of his debauched teenage years, Kavanaugh’s reply was “You’d have to ask him” – an option which the Republican majority had no interest in doing, for pretty obvious political reasons. Should we care that someone accused of serial assaults against women – and who lied on oath during the hearings – should be confirmed to a lifetime role where he can help to make and unmake laws affecting hundreds of millions of Americans? Given that Kavanaugh told the Senate that the Roe v Wade precedent on abortion rights was “ “settled law” while elsewhere he has written that settled law is only settled law until a majority overturns it, one can see why many American women would be (a) enraged and (b) deeply worried about the prospect of his confirmation. In his time in the D.C. Circuit, Kavanaugh often found that agencies don’t have the authority to issue regulations under the law, particularly in the context of the Clean Air Act. Kavanaugh wrote opinions and dissents rebuffing several of the Obama administration’s emissions regulations (E&E Daily, July 10). ….On the D.C. Circuit, Kavanaugh has also taken to heart the Supreme Court’s so-called major questions doctrine, which states that Chevron should not be applied to rules that are economically, politically or socially significant. Notably, the late Justice Antonin Scalia invoked that doctrine in the Supreme Court’s 2014 decision throwing out portions of a rule requiring stationary facilities to obtain air permits for emissions of greenhouse gases. So yes, we all do have an interest in Brett Kavanaugh’s confirmation – not only out of solidarity with US women about the fate of their abortion rights, but also out of concern about his views on environmental law, and on the powers of US corporations. If, as Ardern says, multilateralism is the world’s only sustainable option, then Kavanaugh’s elevation is likely to undermine it.